How Safe are School Buses? - BJE Law, P.A. If you have a child, then you understand the significance of watching your child board a school bus each day and trusting that no accidents will occur along the way to threaten your child’s safety. It’s a huge decision that essentially places your child’s life in the hands of a bus driver, bus mechanic, and the other drivers on the road. Though most school buses arrive to and from school without any trouble, too many children have been hurt through school bus-related accidents. Donasty Smith, for example, was only five years old when she was killed in a school bus accident in Indiana. She should have had 12 more years of bus rides ahead of her, but instead her bus driver’s negligence sent the bus straight into a bridge. Heartbreaking and tragic events like Donasty’s death have renewed questions regarding the true safety of school buses. Overall, school bus travel remains dramatically safer than other methods of transportation during school hours. Fifty-eight percent of student fatalities occur at the hands of teen drivers, while 23 percent are caused by an adult driver. Bus crashes, meanwhile, account for only 1 percent of total student fatalities. This is a meaningful statistic, but it still acknowledges that school buses can, and have, caused harm to students on their way to or from school. A bus crashing into another vehicle or solid object is the event most parents fear, but many bus accidents occur under different circumstances. Far too many children have been struck while walking to the bus or crossing the street to get home. Others sustain injuries by tripping and falling, and some get hurt on the bus since many states still don’t require seatbelts on buses. 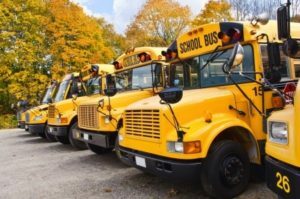 It is entirely possible to file a lawsuit to obtain compensation for an injury or death caused by a school bus. Such lawsuits can prove complicated because in addition to the school bus driver himself, it’s also possible to sue the school district, transportation company, third party in charge of maintenance, bus manufacturer, parts manufacturer, and even any government entity responsible for roadway conditions that contributed to a crash.